This is a copy of a paper published in Amici, the ASA Sociology of section newsletter, 11(2):12, Summer 2004. Also available in pdf format. Please cite as: Deflem, Mathieu. 2004. 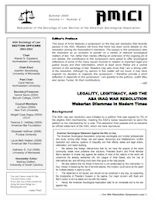 “How the ASA Leadership Damages Sociological Research: A Scholarly and Professional Viewpoint.” Amici, ASA Sociology of Law section newsletter, 11(2):12. As a sociologist and member of the ASA, I am appalled by the recent actions the ASA Council has taken in the matter of the resolution on the war in Iraq. The ASA leadership, not its members, have spoken. By implication of the very mission of ASA, the Association cannot pass nor defeat resolutions on matters that are not inspired by our commitment to promote the scientific analysis of society. Council, therefore, should not even have forwarded the resolution for a vote. Among the many negative effects of the resolution, the official position of the ASA denies the diversity of opinions on the morality of the Iraq conflict among the Association’s members. The most contentious aspect in this matter is definitely not whether the ASA can take action on the war as an Association, but that the war resolution is by definition a highly normative matter on an important moral issue that the ASA cannot legitimately comment on. The Association and its members as members are experts in science, not morality. Members of the ASA are sociologists. We are not only sociologists, but that will not and should not concern us as members of the Association. The ASA resolution denies any respect for who we are in a manner only the greediest of institutions do. When will the ASA police come to get you? This issue is not a matter of personal opinion versus position by the Association, but about the nature of such opinions, whether they fall within the province of the objectives of the Association or not. If it is true that the present ASA by-laws allow or even compel Council to move ahead with resolutions even when these are beyond the expertise of the discipline, then the by-laws are not congruent with the mission of the ASA. As nothing is more foundational to the ASA than its mission, the exclusion of issues beyond the expertise of the discipline would be a decision made a posteriori. Not only is the position of the ASA leadership not sociological, it has in effect seriously jeopardized my own sociological research activities and possibly those of some of my colleagues. As a sociologist with an expertise in law and social control, I am presently investigating the policing of terrorism. In that capacity, I meet with and interview officials from government and law enforcement. What are they to think about a scholar whose professional Association by its own admission is no longer interested in scientific work, but instead involves itself with ideological and political positions!? It is in this context baffling to note the recent critique of the ASA leadership on the “Politically Motivated Attack on NIH Peer-reviewed Research”. Originally, when posted online, this statement referred to an “Ideologically Motivated Attack”, but that makes no difference. Whether it’s called political or ideological, such a critique by the ASA can since and because of the Iraq resolution no longer be scientific in nature. Instead, it has to be assumed that this position is itself political or ideological, not disagreeing with the influence of politics or ideology on science, but with the influence of a particular political or ideological stance. As an active member in the ASA, I find that the Association continues to provide an excellent forum for communication among its members, especially through the Sections where scholarship fortunately remains central. However, from an organizational viewpoint, it remains sociologically appropriate to analyze the ASA leadership, especially the move towards the formulation and adoption of political or ideological resolutions. These issues require intense investigation on the behavior of the ASA, as an institution where, indications are, the leadership is divorced radically from its mission. Then we may find out why some in the Association have apparently abandoned any concerns to practice the ideal of science and have the courage to think the unthinkable. * I should add that in the meantime another letter by me, about this year’s resolution, will be published in Footnotes (August 2004). It will be followed by a response, of course.